According to DocArzt of Thetailsection.com blog in his post here, he has been authorized to reveal that the "Sunset on the Beach" event for Lost's Season 4 world premiere has been confirmed. DocArzt has always had some good (and mysterious) contacts at Lost, so this latest news seems to be very credible indeed. 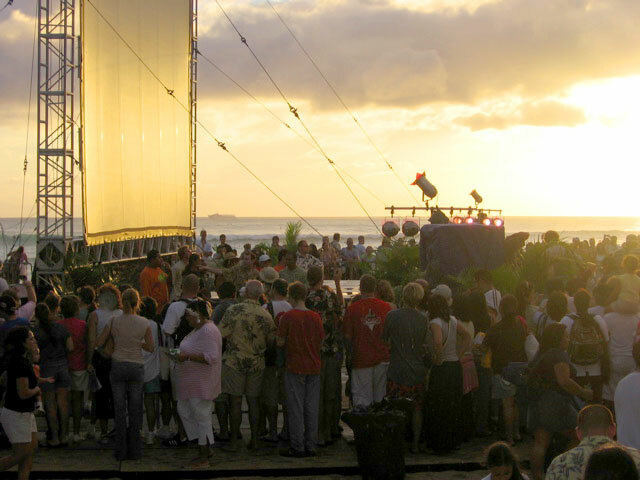 The event is a series sponsored by the City and County of Honolulu, and typically shows movies for residents and tourists on a large screen erected directly on the sands of Waikiki Beach in Honolulu, HI, where Lost is filmed. However the Lost premiere events have generally been announced and confirmed by the City and County usually only a scant week before the event, generally held on the Wednesday or Saturday before the broadcast premiere of the season on ABC. DocArzt revealed that the event for the world premiere of of Season 4 will be held on the "first Saturday of February", which makes it February 2, 2008. With such advance notice, diehard Lost fans can now plan (or dream on planning) their travel arrangements to Hawaii around a confirmed date to be on hand for the teeming crowds of thousands that have historically thronged the premiere and the appearance of the cast of Lost in Waikiki. Lost's Writing on the Wall?